Isn’t this such a cute cake? After I took a Wilton course on cake decorating back in 2006 I decided to make this same design for an Easter family get together. It garnered a lot of oohs and awes, for what I believe to be a pretty simple design. Take it from this left handed baker, I love to decorate cakes that don’t have lettering involved. Why? If you’re left handed you know the answer already, but if you’re right handed the answer is because I can’t see a damn thing I am writing because my left hand is in the way. Grr! So designs like this one make me happy! 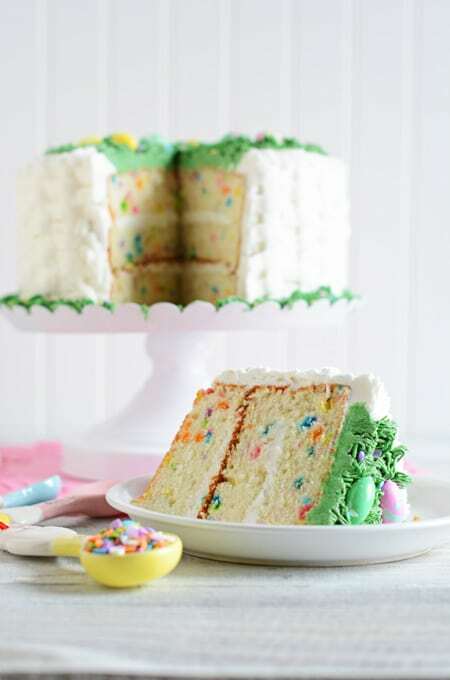 You can make this cake in a 8-inch or 9-inch round cake pan. I used an 8-inch cake round; I prefer my cakes to have more height so that is why I usually use an 8-inch round cake pan. Just be sure to adjust your baking time. A little more time for an 8-inch and a little less time for a 9-inch. Adding a sugar syrup is a great way to add a little more moistness and flavor to your cake. A great flavoring for this syrup is a cake flavored vodka! Or you can always use vanilla extract. This is where you can have a little fun with flavorings! Now about the Buttercream in this recipe, you will absolutely need a 5 Quart KitchenAid Mixer . The buttercream recipe used here is one that makes incredibly smooth buttercream with no air bubbles. Check out my recipe for White Almond Cake to see a few pictures of the buttercream in the mixing bowl. It will fill it up completely. DO NOT try to make this buttercream with a hand mixer. The frosting must go all the way up the paddle of a KitchenAid 5 quart mixer to keep the air bubbles out. Okay, now with that out of the way, here are a few tips when using this Buttercream. Use hi-ratio shortening or shortening with trans fat. No Crisco! In my early cake years, Crisco decided to remove trans fat from their shortening and then cake decorators everywhere started noticing their buttercream cracking. Later on we found out that it was due to the lack of trans fat in the shortening. Instead, look for store brand shortening. Those usually have trans fat included. The best thing to use would be High Ratio Shortening but to make it simple I use shortening with trans fat. It’s easy to find and I don’t have to special order it. This recipe makes a lot of buttercream! You will have leftovers. Plan on making another cake or cupcakes to use the remaining Buttercream. 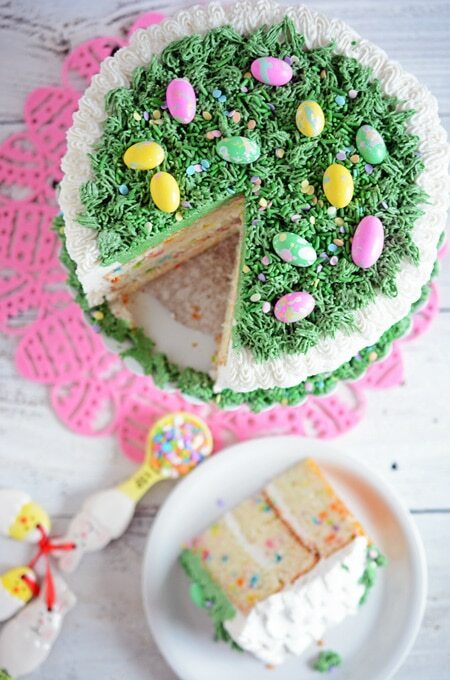 I am making another one of these Easter Confetti Cake in the next couple of weeks for a church pot luck. I plan on using the remaining frosting for that cake. Did you noticed I said ” a couple of weeks”? That’s right, this buttercream is shelf stable. No dairy is used making this Buttercream shelf stable and able to sit out on your kitchen counter for a good while. If you want a white frosting, be sure to use a clear vanilla extract like I did. Otherwise, your frosting may not stay a true white. Depending on what decorations you are using this buttercream for on your cake, you may need to add more of the coffee creamer liquid like I did. 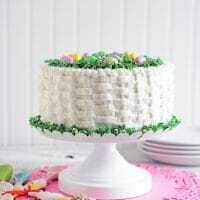 When I first started the basket weave my buttercream was pretty stiff. I had to add a little more liquid to get it smooth. You do not have to use this Buttercream. 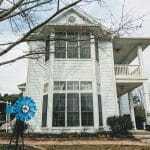 There are plenty of decorators buttercream recipes online. When I started decorating cakes I used Wilton’s recipe, but be sure you do not use Crisco. That goes for any shortening based buttercream in my opinion. Now comes the fun stuff, the decorating!!! I have more details in the recipe below as to what piping tips I used. For the sprinkles I used Egg Hunt Sprinkle Mix on top, as well as some candy coated milk chocolate almonds I picked up at Sprouts. If you can’t find those, Jordan Almonds will also do the trick. Or even Jelly Belly’s . I just placed a few of those on top with the sprinkles. I also finished off the grassy border with a few more sprinkles as well. I hope you enjoyed reading about this cake as much as I enjoyed making and eating it! 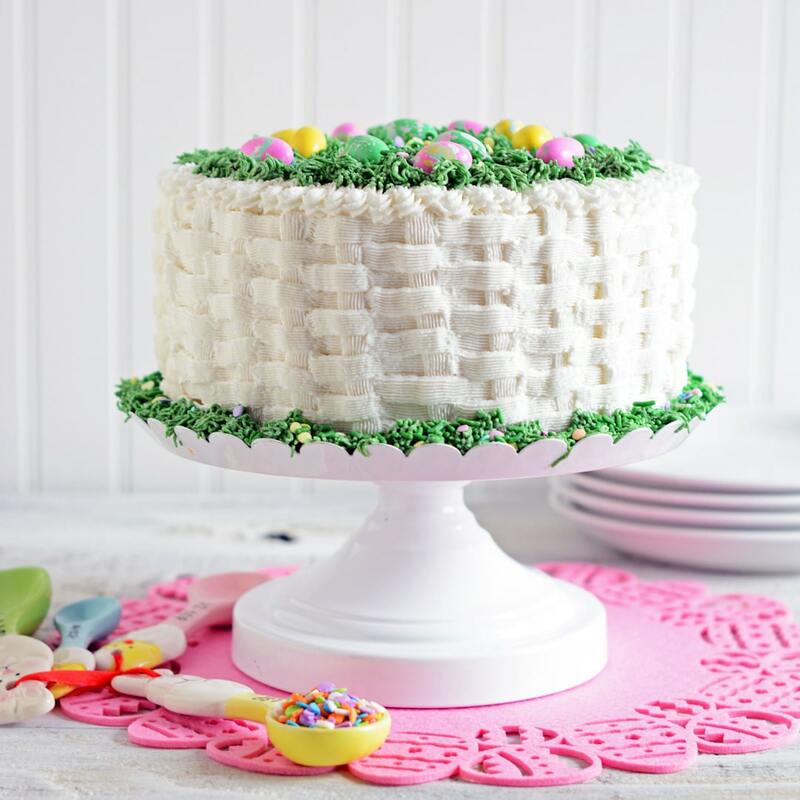 This Easter Confetti Cake is such a fun one and you can turn it into any party cake or holiday cake by just switching up the color of sprinkles you use. 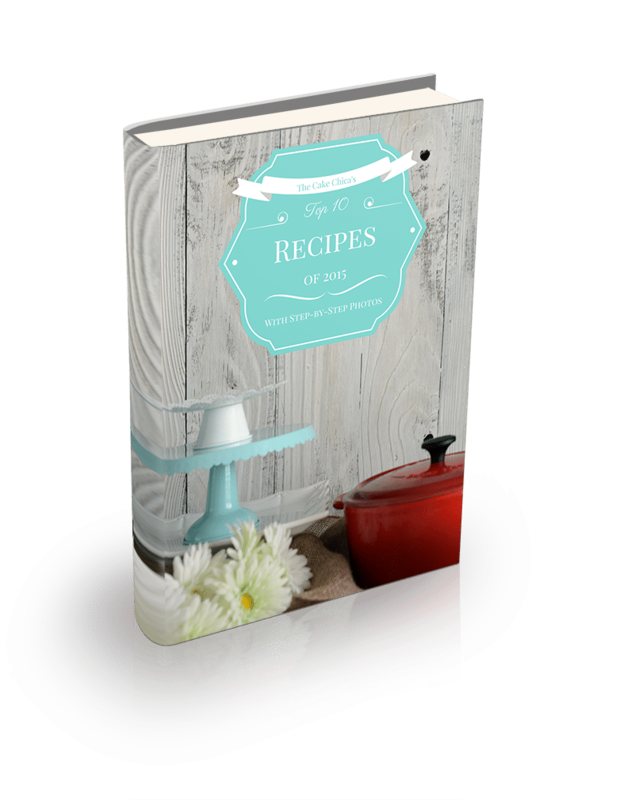 Before you go be sure to check out some of these other recipes I think you’ll like, such as Valentine’s Day Red Velvet Cake, White Almond Cake and Andes Mint Chocolate Chip Cookies. Follow me on social media: Facebook, Instagram, Twitter, Pinterest and Yummly. I also have a newsletter called The Weekly Recap be sure to subscribe and I’ll send a link of the latest recipe as well as what’s coming up next on The Cake Chica. Talk to you next week! Enjoy! Heat oven to 350 degrees. Coat three 8-inch or 9-inch round cake pans with a non-stick baking spray, I use Bakers Joy. Set aside until needed. In a medium bowl, stir together milk, egg whites, applesauce and extracts. In a large bowl, whisk together flour, baking powder and salt. In a stand mixer, beat butter and sugar on medium speed until light and fluffy, about 5 minutes. Reduce mixer speed to low and add flour and milk mixture in three alternating additions, starting and ending with the flour mixture. 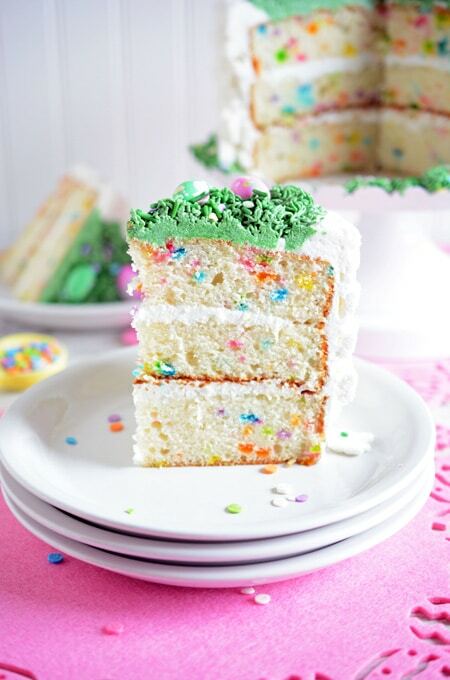 Fold in rainbow sprinkles. Divide batter evenly among pans. Bake until a toothpick inserted in the centers comes out clean or with a few moist crumbs, about 30 to 35 minutes for 9-inch cake pans, or 35 to 40 minutes for 8 inch cake pans. Cool cakes in their pans on wire racks for 5 minutes. Run a knife around the edges to loosen the cakes and invert cake layers on wire racks to cool completely. On low speed, cream the shortening, vanilla extract and 11 to 12 tablespoons hot liquid coffee creamer into a 5 quart stand mixer bowl. Cover the mixer with a kitchen towel to keep the contents from coming out of the bowl. Continue to mix on low speed until combined. Once combined, turn the mixer up to medium speed and beat until creamy. Pour the first 3 pounds of powdered sugar into the mixer bowl, with mixer running on low speed. When the frosting starts to come together, stop the mixer and scrape down the sides of the mixer bowl. Pour in the last 2 pounds of powdered sugar and mix on low speed. When combined, turn the mixer up to high speed and let it beat for 5 to 7 minutes until very smooth. Scrape down the sides of the bowl frequently while the mixer is going. You want the icing to completely fill the mixer bowl. It should be covering the paddle attachment entirely. There should be no air gaps around the sides of the bowl. If you frosting makes a sucking sound, you will need to add a few more drops of the hot coffee creamer while scraping down the sides of the bowl. The frosting should completely cover the bowl side to side and all the way up the top of the paddle to the springs. The icing should be smooth and airless. Cool before using. Store left over coffee creamer in the refrigerator and heat up before your next use. In a small saucepan, combine the sugar and water and bring to a boil over medium heat, stirring to dissolve the sugar. Remove the pan from the heat and stir in liqueur or extract and set aside. Trim off cake domes with a serrated knife or cake leveler. Place first cake layer cut side up on a cake pedestal. With a pastry brush, generously brush on soaking syrup on the first cake layer. Spread about 1 cup buttercream on top, leaving about ½-inch from the edge free of frosting. Repeat this process with the second cake layer. Place the third cake layer on top, cut side down. With a wooden skewer poke a few holes on the top of the cake to help the soaking syrup permeate the cake. With a pastry brush generously brush the top of the cake with soaking syrup. Set aside about 2 cups of the buttercream for the crumb coat. For the crumb coat, lightly frost the top and sides of the cake. This step will help keep crumbs out of your final frosting. Place cake in the refrigerator for 15 to 20 minutes. Spread buttercream on the top and sides of the cake with an offset cake spatula. 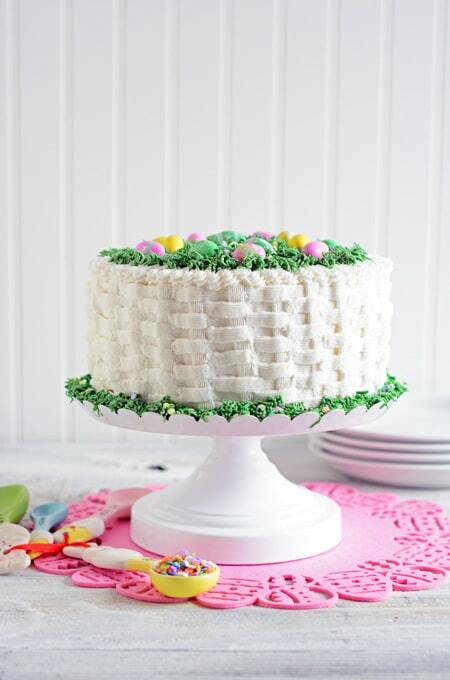 Use a Wilton tip #48 for the basket weave effect. Do this all around the sides of the cake. Use a piping bag fitted with a Wilton tip #21 for the border on the top of the cake. 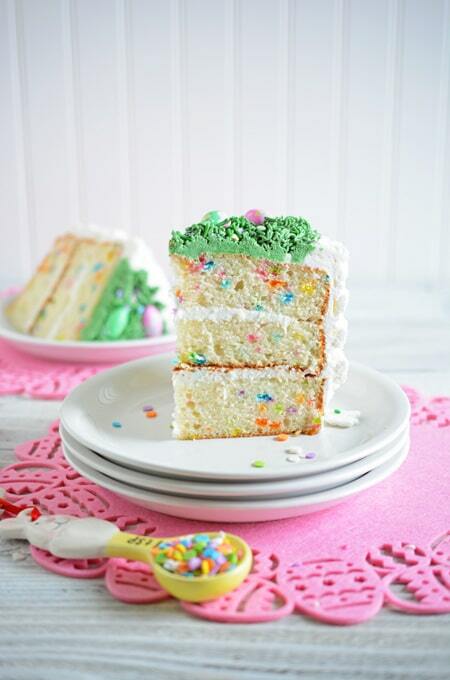 Set aside about 2 cups buttercream and tint with green gel food coloring of your choice. 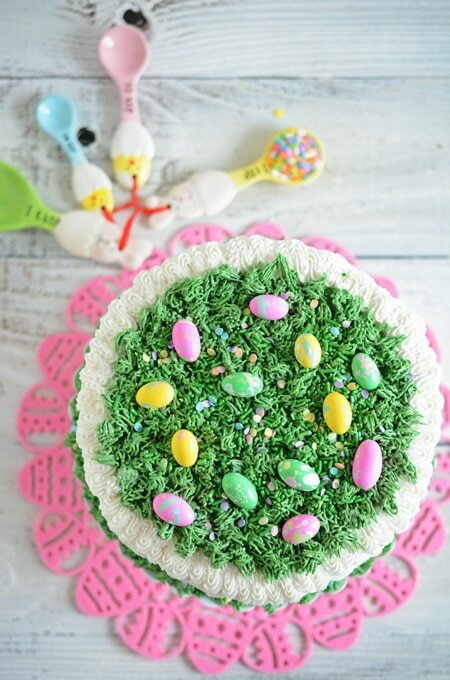 Use a piping bag fitted with a Wilton tip #233 for the grass on the top of the cake. Sprinkle Egg Hunt Sprinkle on top. Place a few Jordan Almonds on top. 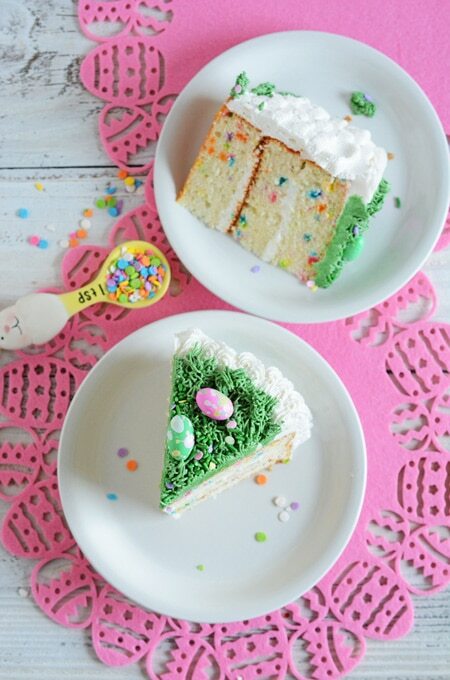 Use remaining green buttercream to pipe grass around the edges of the cake and sprinkle a few more Egg Hunt Sprinkles on top. This cake can be stored at room temperature for 3 days.